Swami Vivekanand English Schoool (Swami Vivekanand English Schoool), Pune Published Job Notification for 04 Computer Teacher – Primary Teacher & More Posts. 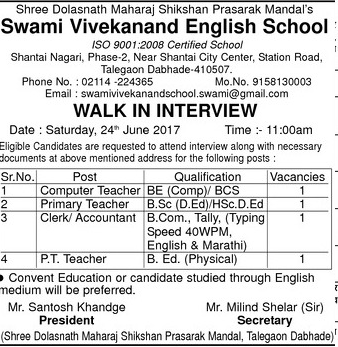 Candidates who wish to apply must look at Swami Vivekanand English Schoool Recruitment 2017. Eligible candidates can apply offline before 24-06-2017 (24th June 2017). Interested & Eligible candidates may attend for walk in interview along with all the documents addressed at Shantai Nagari, Phase-2, Near City Center, Station Road, Talegaon Dabhade – 410507. Starting Date, Last Date to Apply Offline at Swami Vivekanand English Schoool which candidates should be remember as follows.